Ye Zhou is an artist. 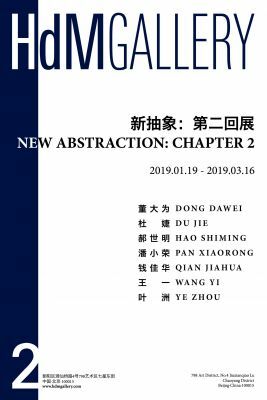 HdM GALLERY Beijing is pleased to announce our forthcoming group exhibition ‘New Abstraction: Chapter 2’, which continues the exploration of abstract art begun with "New Abstraction: Chapter 1" in 2014. It will feature 7 artists, including Dong Dawei, Du Jie, Hao Shiming, Pan Xiaorong, Qian Jiahua, Wang Yi, and Ye Zhou. The show will open on January 19th 2019 and last until March 16th 2019. Ye Zhou was born in an artistic family, his early works mainly consisted in representational and realistic paintings. In recent years he has tried to break away from the stereotype of genre painting and to explore art with his own concepts in recent years, advocating that ‘nothing is concrete’. By exploring geometry, physics, mathematics and other structures, he attempts to rediscover the essence of color and shape, and advocates an attention nature, life, the universe and the future. Du Jie principally uses the paintbrush and an unadulterated acrylic paint to draw a continuous and complex closed loop. This repeated process leads to an endless circular movement, full of freedom and also constraints, which runs through her life and experience. Hao Shiming’s recent works have capped his exploration and expansion of language and its inner possibility of expression, thus turning to a kind of personal catharsis. He tries to extract the purest elements from his own cultural tradition and transform them into a way of expression with cultural connotation and distinct cultural genes in his own way. The ‘marker series’ works of Dong Dawei originates from an accident: realizing that staining had been seriously neglected in art history as a technique of painting, he paid attention to the effect of ink on paper after a long period of staining, thus deciding to explore this technique seriously. His works explores the relationship between space, time and material in an comprehensive and coherent way. The works of Pan Xiaorong take ‘colour’ as the core of research and expression to break the public’s conventional understanding of ‘shape’ in abstraction, and to strengthen the richness and uncertainty of colour through a straightforward method. Qian Jiahua’s works originate mainly from her fragmented perception of the external world and the imagined vision of a dialogue between her self conscious and the outside. The transformation between two-dimensional and three-dimensional with certain lines and rigorous geometric colour blocks compose a virtual space full of conflicts and contradiction. Wang Yi’s works create a dynamic and deep visual effect through the arrangement of bright colours and hard-edged geometric figures. His works emphasize the simple directionality of painting gestures, and rely on the number of layers applied dozens or hundreds of times to industrial panels to change the completion effect. He attempts to confront the factory-style fast production mode in the current artistic environment with a slow personal production mode, and recall the meticulous process of classical painting. The exhibition shows artists of different ages displaying their own memories, experiences and emotions in different forms, works and gestures, and born at different times they try to trigger deeper resonance and interaction among audiences beyond images.